I thought that this was supposed to be a relatively quiet weekend for TAC distance runners, but James West went and produced another National Championship win today ! He won the under 20 men's 1500 metres in 3.51.79, producing a stunning last 100 metres to defeat Robbie Fitzgibbon of Brighton Phoenix. In what was a relatively tactical affair, James took three seconds from his indoor personal best time. Kieran Reilly competed for Indiana in the Big10 Conference, in Ohio, running the heats of the 800 metres on Friday. Kieran lowered his indoor personal best substantially to 1.52.78, to finish sixth, so will not qualify for Saturday's final. 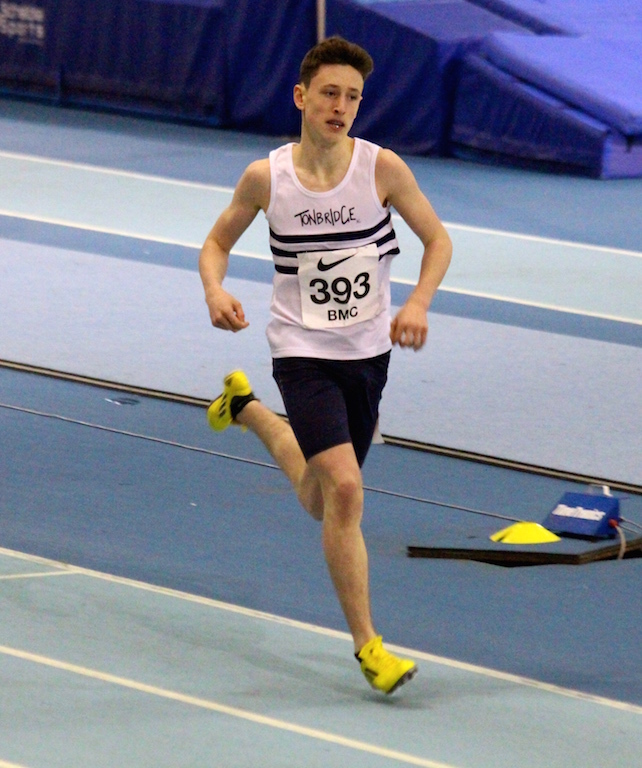 Kieran's time took almost two seconds from his indoor best time and was just 0.6s away from his outright pb. Robbie Farnham-Rose competed for Alabama in the South East Conference, in Kentucky, running in the mile. Robbie placed third in his heat, which was an automatic qualifying position for the final. He ran 4.06.48. In Saturday's final Robbie placed third in 4.03.87, just 0.5s away from the winner. 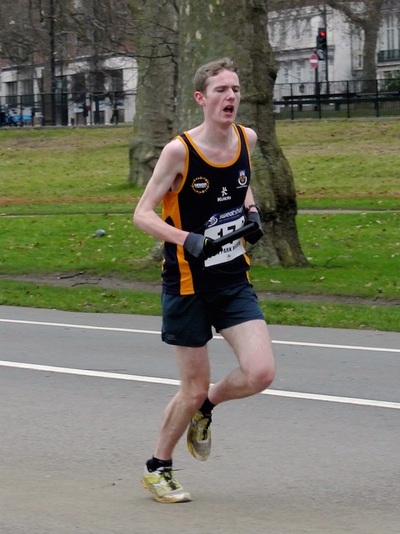 Chris Olley used the Serpentine lunchtime 5k event in Hyde Park, as a good hard training run and finished first in 15.27, about a minute ahead of the second placed runner. 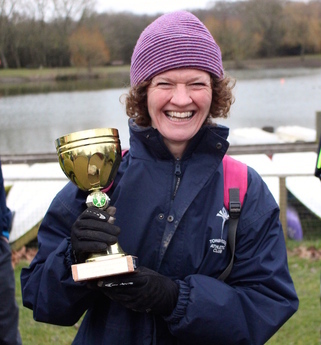 Sally Musson showed that she is still running well, recording 21.29 in the over 60 category. Videos of all ten National Cross Country Championship races now loaded ! 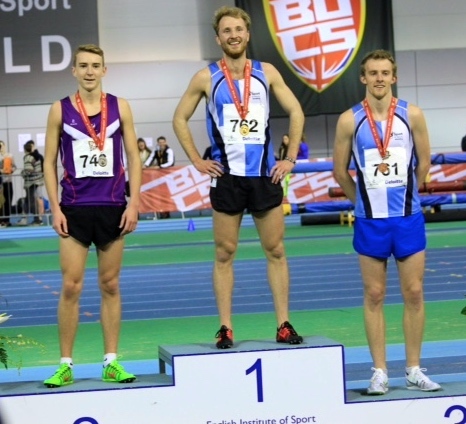 James West had one of his best ever races, when he finished second in the 1500 metres at the BUCS Indoor Championships. He had won his heat on Saturday in 4.01.37 and in a tactical final on Sunday ran 4.00.15 as Ben Coldray, of St Marys won in 3.59.55. 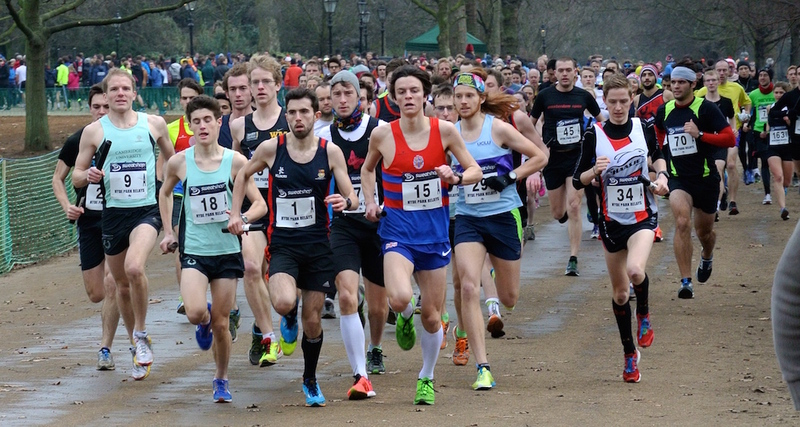 Saturday 21st February - Videos of all ten National Cross Country Championship races now loaded ! I have a lot of work to do editing photos, videos etc from the National, but will get it all done over the next day or so. Its also my dad's 80th birthday lunch on Sunday, so apologies if only a little appears here today. Many will now by now that TAC came away from the championships with three team gold medals, a team bronze and an individual winner. It was quite a remarkable day (and evening) and I would like to thank everyone who ran, supported and helped. 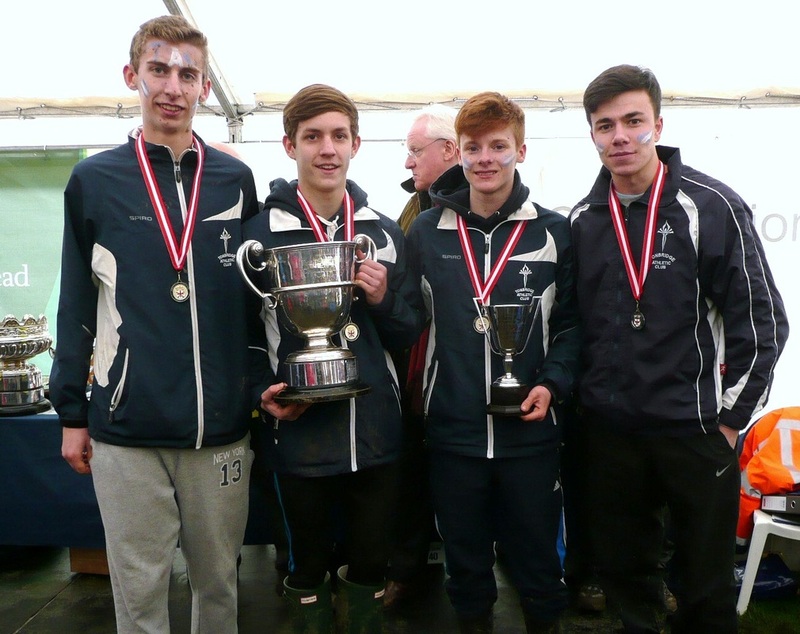 Senior men - 11th (6 to score) and 9th (9 to score) - best ever places. Ryan Driscoll 77th. 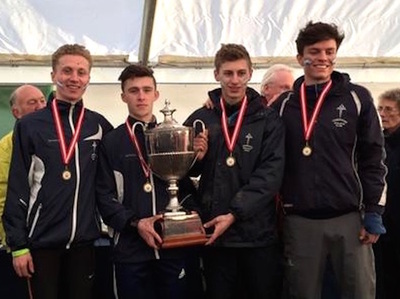 Under 20 men - 1st National Champions . Max Nicholls 4th. 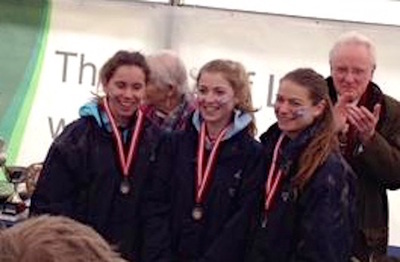 Under 20 women - 3rd. Nicole Taylor 22nd. Under 17 women - 7th. Alice Ralph 40th. Under 15 boys - 1st National Champions. James Puxty 4th. Under 13 boys - 5th. James Kingston 19th. Under 13 girls - 14th. Lizzie Miller 30th. Robbie Farnham-Rose ran 1200 metres in 2.54 to help Alabama's Distance Medley Relay team qualify for the National Collegiate Championships. The 1200m is the first leg and is followed by the 800m, 400m and 1600m. Alabama placed third at the Alex Wilson Invitational, held at Notre Dame, Indiana. The DMR (Distance Medley Relay) is a popular event in the USA, ran both indoors and outdoors. Message from the Johnstones in Australia ! We received an update from Abi and Amanda Johnstone in Australia. 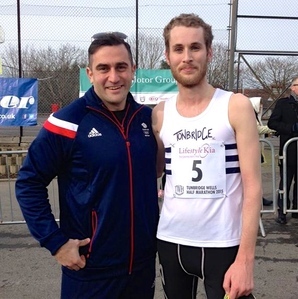 Read the news on the Distance Runners Diaries page for 2015. They wish everyone good luck at the National. Dan Bradley produced another good road race performance today in winning the Tenterden 5 miles in 25.41. This gave him a 98 second cushion over second placed Jack Goss of Invicta and broke the course record. The time is also only just 17 seconds away from Dan's pb, set on the ultra flat and fast Victoria Park course in London. 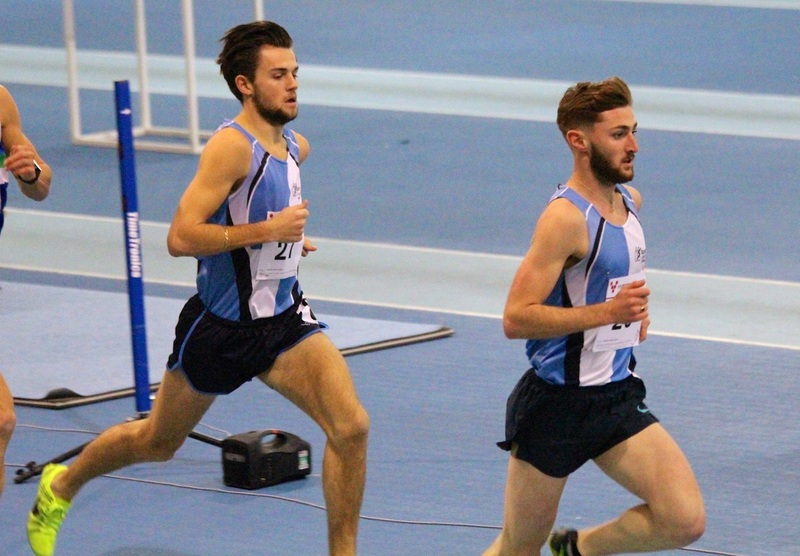 Kieran Reilly raced an indoor 1 mile at Indiana on Friday evening, but was disappointed with his time of 4.12.52. He then ran 1200m in the Distance Medley Relay in 3.05. James West ran 4.06.09 for a very tactical 1500m and finished 4th in his heat at the British Championships, at Sheffield. Unfortunately, it was the slower of the two heats and only the first three qualified for Sunday's final. The fastest losers qualifying spots came from heat two. The updated TAC Grand Prix League table is in the file below (courtesy of Mark Pitcairn-Knowles). The next qualifying run at Tonbridge is 28th February. 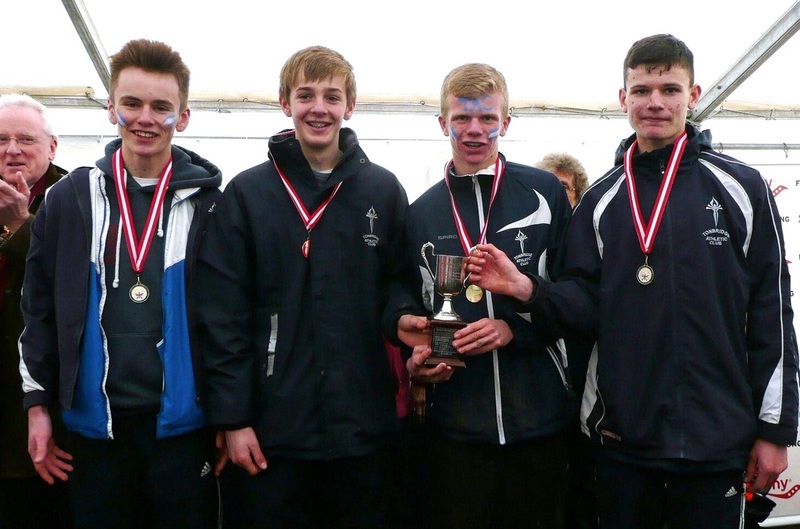 James Thompson won an unusual cross country race in Gloucestershire on Saturday. From what I can gather its run over a 3 mile course, that normally accommodates a horse race ! James reports that it was very tough but was very pleased with the win, since it was his first race for a while, after injury. James Thompson being interviewed after his win ! Ben Cole produced another stunning performance, underlining his continued improvement, as he took 86 seconds from his personal best, to finish third in this high quality road race. Ben's time of 30.38 is the fastest by any TAC athlete for many years. Cameron Knapp finished 67th in 35.20, which improved his best time for the distance by 27 seconds, that he set in 2014. Eva Kolivoskova-Martin ran a massive pb of 45.38, showing her improvement in recent weeks. Just before Christmas a sub 50 was in her sights ! Welsh Athletics Indoor Open Meeting - Videos loaded ! Luca Russo and Alex Hookway travelled to Cardiff to finish off their indoor track racing campaign. 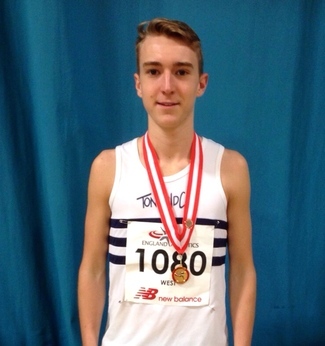 Luca improved his indoor 1500m pb by two seconds to finish third in the A race with 3.55.11, tantalisingly close to the 3.54 standard that would have got him into next weekends British Championships. 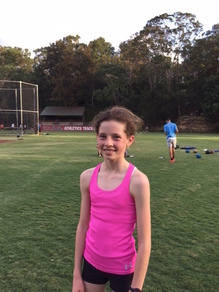 Alex front ran the B race at 800m but ran out of steam on the last 200m to record 2.00.33, to place third. Saturday 7th February - Video loaded ! Robbie lowered his personal best and ran the fastest ever indoor mile by a TAC athletes, when he won in Nebraska in 4.01.34. Swanley Park hosted the Kent League for the second time this season, for what was the final fixture for all the age groups. Somehow TAC came away as league champions in both the senior mens and senior women's events, although in entirely different circumstances. The men had gone into this last race tied with both Blackheath and Cambridge Harriers, whilst the women led Invicta by a single point. Blackheath came at us hard in the men's race, spearheaded by a fine win from Scott Overall, who ran the London 2012 Olympic Marathon for GB. 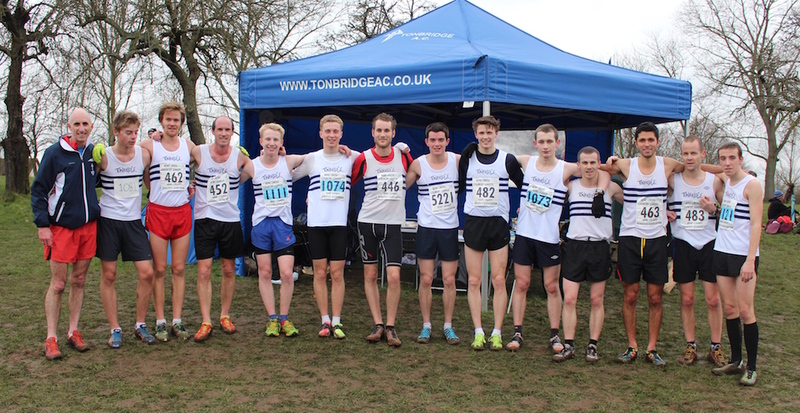 However, TAC put in a battling show with George Duggan 5th, Tom Cox 6th, Dan Bradley 11th and Dan Watt 12th. The ladies finished 6th on the day, but somehow it was enough to clinch the league, with Invicta not completing a team and the others being far enough behind, before the day. Thanks go to Ellen Pitcairn-Knowles, Jayne Mallyon, Rachel Fagg and Estelle Fenton who made up todays team. Kathleen Faes and James Puxty won the under 15 races, although Sam Crick, with a terrific race on the day, in 2nd claimed the league title. 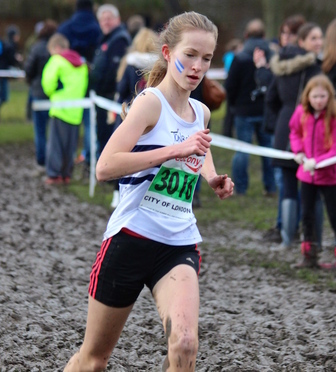 In the under 17s Alasdair Kinloch and Jamie Goodge were 1-2 in the men's whilst perhaps the best run of the day came from Alice Ralph who won her first ever Kent League race in fine style. Full results from today and final league standings are on the Results 2015 page. Photos below courtesy of Steve Keywood. Three TAC distance runners were in action at Lee Valley. Ryan Driscoll had his first ever indoor race and ran 8.26.44 for 3000m to place third, with Luca Russo 8.33.13 for an indoor pb. Tom Dean raced the 800m and ran an indoor pb of 2.04.8. Judd School had a fine win at the prestigious King Henry V111 School relays on Wednesday, with a team made entirely of TAC runners - Will Whitmore (12.24), Jesse Magorrian (12.27), Stuart Brown (12.02), Miles Weatherseed (11.51), Dan Blades (12.53), Toby Ralph (12.17). Sevenoaks School finished 4th in the girls race with TAC runners contributing as follows - Alice Tyler (14.21), Clara Tyler (15.11), Phoebe Barker (14.07). Full results are on the Results 2015 page. 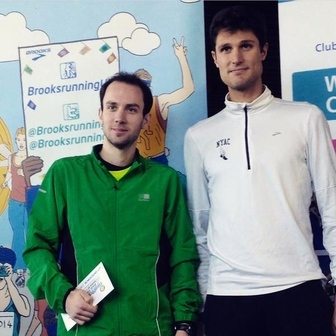 Dan Bradley won this 10k road race, whilst Nicola Summerfield was the fifth lady finisher. 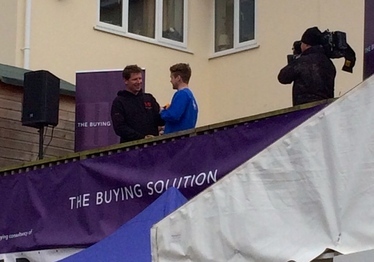 Dan ran 33.26 and beat Mike Coleman, who won the bronze medal in the Kent Cross Country Championships, by seven seconds. Nicola ran 42.27 and Cain Bradley was 119th in 46.27. Dan had finished second in this race on three previous occasions, but never won. He led for most of the distance, losing the lead inside the last kilometre, before rallying for the win.